The life worlds of non migrant professionals are complex and need to be understood beyond the narrow propositions of economistic theories that emphasise economic factors alone. 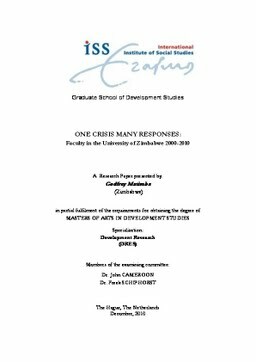 Using the case study of University of Zimbabwe [U.Z], it is demonstrated that political considerations, cultural loyalty, family related, demographic, and professional factors play a significant role in the de-cisions of non migrant lecturers. Most U.Z lecturers do not view themselves as just professional teachers and researchers but active political agents with a role to play in nation building. Political allegiances then pattern economic means of survival and are reinforced by other social, demographic and cultural factors.